Does your relationship with your business feel like a loveless marriage? The start of a business is blissful. You get to set your own hours, making your own decisions and being your own boss. You can work in your PJs- if you want to. You have a 2 minute commute. Not a lot beats it. But it’s so easy for the honeymoon period to disappear, leaving you procrastinating, agitated and frustrated. Do you know what went wrong? What caused this? What happened to your idea of dream living? Sometimes it’s just natural business progression. You get busier, you start taking on more clients, you work more, your stress levels increase. It’s not hard to see how. Yet the love should continue regardless. I’m determined to help you fall back in love with your business, so this Valentines Day, you can celebrate your love for that too. Remember why you started. Probably because you didn’t want to work for someone any more. Remember how unhappy you were in employment and working for someone else? Surely that’s enough of a reason alone? Spark the romance again. Ditch the mundane and boring. Do what you do best and outsource the rest. Monotonous, laborious and repetitive tasks getting you down? If they really don’t need your personal attention, outsource them. There are plenty of virtual assistants who can help, leaving you to focus on the tasks you’re passionate about and best for your business growth. Be honest with your needs. Its so so easy to forget ourselves and invest in our business – but we have needs to. It’s critical to recheck in with your needs. Things change, so I’d advise you check in with your needs, your hopes and desires regularly. Quarterly would be a great practice. Feel the love. Re-read your testimonials and reviews. This is clear proof that you’re good at what you do and your passion clearly shines through to your customers. They love you, so you should too! Be Proud. Make a list of 10 things you’re really proud of. Making it past the first 18 months is an achievement in itself, it’s the time when 80% of start-ups fail. So you’re probably already ahead there. There’s one ticked off the list! Prioritise. Ensure you set time aside to work on, not just in, your business. It’s all too easy to get caught up in the daily running of a business, without taking time to reflect, improve and grow the business. Look after yourself. Get some pampering. 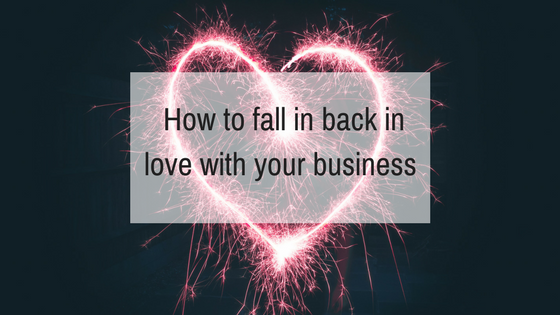 Chances are, if you’ve fallen out of love with your business, your mind will feel uneasy. The constant worry and stress is not good for your personal health so book a treatment that best relaxes you. See it as an investment in not only your business, but your personal health too. Get down and dirty with the details. Analyse what really has got you down. Is it your working environment? Your equipment? Your team? Once you’ve established the root of the problem, it’s time to change something. Set goals that excite you. Are your goals driving you enough? Demanding enough? Do they make you want to jump out of bed in the morning? Connect with those you love. Talk to a friend, your partner, another business owner. Someone you trust, who won’t judge you nor make you feel inadequate. Sometimes just getting it off your chest can work wonders. Take some time out. Take a break . A holiday is one of the most beneficial things you can do for both your personal and business health. Time away from your laptop and phone will allow you to refresh your mind and return with a revitalised outlook on things. Don’t feel guilty for it either, your clients will understand and your refreshed persona upon return will make it all worth while. Grow your mind. This will help you to grow your business and develop and attitude of gratitude. Look at it – you have your own business – how amazing is that. Just set realistic expectations and go to work on your work attitude. If all else fails. Finally, if none of those work, speak to a business coach. Getting a professionals perspective might just be the help you need. They’ll come with fresh ideas, ways to streamline your business and achievable goals that are sure to excite you. I really do believe that a spell like this needn’t mean the end of your business. You’ve worked hard, you’ve put in the hours and you believed in yourself enough in the first place to give it a go. Let’s get the love back and 2018 will be just just epic.